America has more than 250,000 rivers, coursing over more than 3 million miles and serving as integral trade routes, borders, passageways, sewers, and sinks. Over the years, based on our shifting needs and values, we have harnessed their power with waterwheels and dams, straightened them for ships, drained them with irrigation canals, set them on fire, and even attempted to restore them. 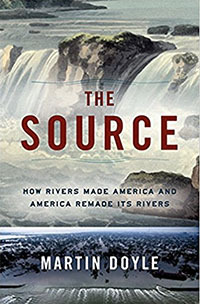 This environmental history tells the story of America and its rivers, from the U.S. Constitution’s roots in interstate river navigation, the origins of the Army Corps of Engineers, the discovery of gold in 1848, and the construction of the Hoover Dam and the TVA during the New Deal, to the failure of the levees in Hurricane Katrina and the water wars in the west. Along the way, it explores how rivers have often been the source of arguments at the heart of the American experiment―over federalism, sovereignty and property rights, taxation, regulation, conservation, and development.